The White Lightning Bike Johnny solves the problem of how to store and transport a bike without the mess. Have you ever put a muddy mountain bike into your car or left a bike sitting in the garage for the winter? You end up with a dirty truck or a bike damaged by the elements. 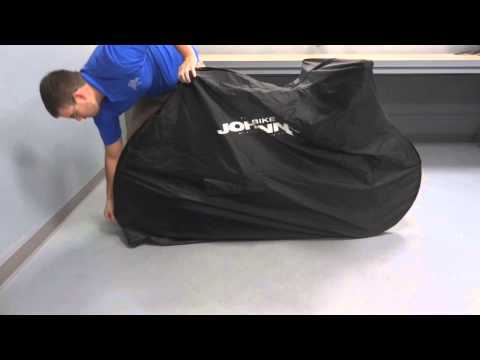 With the Bike Johnny, you can save your car's interior and protect your bike from the elements! The White Lightning Bike Johnny is made from a water repelling and UV resistant nylon. This durable material protects your bike from the elements and your house, apartment, dorm, or car from your bike. Designed with grommets on the side, you can easily lock your bike for extended storage while keeping the bike covered. The Bike Johnny also features bi-directional zippers that make installation a breeze. The Bike Johnny comes in one size that fits road bikes, triathlon bikes, mountain bikes (including 29ers), BMX bikes, hybrid bikes, and comfort bikes. It also includes a free pouch for easy storage when not in use.